This semi-detached villa with private swimming pool is located on the Castro Marim Golf & Country Club in the Algarve, near the Spanish border. The villa is located on a dead-end street and borders the fairway of the 9th hole. 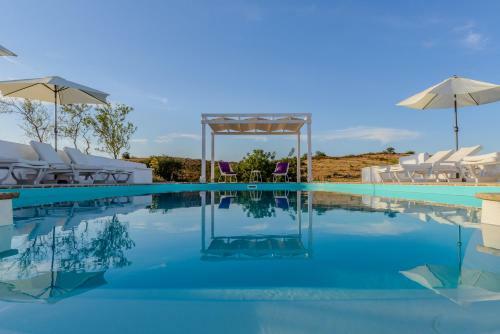 Surrounded by 72 acres of farmland in Castro Marim, this property offers elegantly furnished apartments with a kitchenette and private patio. The gardens come with a large outdoor pool for refreshment. Only 2 km from the Algarve coast, Casa da Vinha is surrounded by an orange and olive grove. In the garden, guests can relax in a hammock next to the outdoor pool. Monte do Malhão is a rural tourism unit which provides accommodation in modern and elegant suites. Featuring a green garden and a bar, it is 5 km away from Praia Verde. The suites feature a terrace with views over the garden.